A fire ant bite can cause several health problems for individuals. The health problems can be related to the skin and be minor in severity or can affect the whole body and be much more serious. In either case, a fire ant sting treatment is recommended to lessen the symptoms or prevent serious health complications. Before discussing symptoms and possible treatments for a fire ant bite, it is necessary to provide some basic information about fire ants. There are many different species of ants. Ants live in colonies that range from 100 to over one million ants. Some ants bite or sting, while others do not. One type of ant that does sting is the fire ant. What is a fire ant and how do you identify one? Fire ants can look like ordinary house or garden ants. However, their bodies and antennae are different. More specifically, a fire ant is small and coppery brown to black in color on the head and body. The abdomen is darker. The length of fire ants varies from 3 to 6 mm. They can be distinguished from other ants due to their rather aggressive behaviour, especially near their nest. Fire ant nests have no obvious entry or exit points because the openings are small. Their nests or mounds are dome-shaped and can be quite large: up to 40 cm high by 35 cm in diameter and a meter or more deep. They nest preferentially in moist soil areas. The mounds can be found next to objects on the ground such as wood, rocks, paving stones, and bricks. They can also be found in sunny open areas such as lawns, uncultivated farmland or pastures, and along the side of roads, rivers, and ponds. Unfortunately, sometimes fire ants also nest indoors and can become a serious home pest. Common indoor nesting spots are inside wall cavities, electrical boxes, drawers, and in attics. These types of ants are found throughout the United States, especially the southern states. Fire ants can also be found in South America, Australia, the Philippines, Taiwan, and China. Fire ants generally mind their own business. 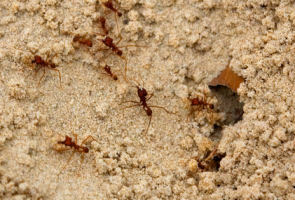 However, a bite is more likely to occur when the ant or its mound is disturbed. If this occurs, many aggressive ants will swarm the threat in few seconds. When a fire ant stings or bites, it first grabs the skin with its mandibles. This anchors the ant so that it can thrust its abdominal stinger and venom into the victim’s skin. The problem is that fire ants do not bite or sting only once. In fact, one fire ant will sting relentlessly. This multiple stinging or biting (7 or 8 stings) is usually in a circular pattern around the area where the fire ant anchored itself. In addition, encounters with fire ants usually involve several or up to a hundred ants. Therefore, the amount of bites from fire ants in an attack can be significant with each one of those fire ants stinging multiple times. A fire ant delivers a very painful and burning sting to its victims. This fiery burning pain is intensified because of the likelihood of multiple bites or stings. It is for this reason that the fire ant got its name. Other symptoms can be divided into minor reactions that generally affect only the skin or more serious allergic reactions. In addition to the fiery type stinging pain, which will last an hour at least but potentially several hours, a fire ant bite will cause a welt or hive to develop at each sting site. A small blister will then form on the skin at the sting sites within 6 to 24 hours. The fluid in the blister then becomes cloudy. The area around the sting sites may swell, itch, and be red in color. Sometimes a red halo forms around the stings. The swelling can last for two or three days. If the blisters are not broken, the skin will heal on its own in about a week or two with only basic fire ant bite treatment procedures being required. The blisters may also break without being disturbed after a few days and a scab will form. After complete healing of the skin, the scab will fall off and a small scar on the skin may be evident. If the blisters are broken, likely due to excessive scratching to ease the itch, then there is a risk of an infection developing at the bite site. A bite from a fire ant may cause more serious reactions in a small percentage of the people (less than 1 percent) who are stung. This type of reaction may occur at the first sting or may result later in time when an individual is stung again. In these cases, a prior sting sensitizes the individual to an allergic type reaction if the person is stung again sometime in the future. The symptoms of an allergic bite reaction to a fire ant are similar to stings from other insects. These include general flushing of skin, hives all over the body, swelling of the face, eyes, tongue, lips, and throat, slurred speech, chest pains, headache, sweating and nausea, faintness, and wheezing or difficulty breathing (anaphylaxis). These systems usually occur immediately or within an hour of the stinging. In rare cases, serious reactions to fire ant bites may occur several hours after the attack. For major allergic reactions caused by this ant bite, medical attention should be sought after immediately because death can occur if no action is taken. If appropriate steps are taken the prognosis is good. The bite victim should remain calm. Individuals that know they are allergic to insect stings should have an epinephrine auto-injector such as an Epi-Pen with them. The Epi-Pen should be administered if the signs of an allergic reaction become evident. After injection, the victim should be transported to hospital immediately. Nothing should be given by mouth before arriving at the hospital. At the hospital more epinephrine may be given as well as oral steroids. Desensitization is a treatment procedure that may be helpful in protecting allergic individuals from serious reactions caused by insect bites or stings. This type of treatment is performed only under very close medical supervision. Following a few simple rules can prevent a fire ant bite. Individuals with known allergies to fire ant bites should strictly follow these recommendations. Whenever outside in an area where fire ants are known to reside or in areas where fire ants are more likely to be, then shoes and socks should be worn. Careful attention should be paid to where you are standing or stepping to avoid a fire ant bite. Avoid brightly colored clothing and wear long pants and a long-sleeved shirt. Do not sit or lay down on grass. By wearing gloves when working in grassy areas or in the garden a fire ant bite can be prevented as well. Do not go near fire ant mounds and definitely do not aggravate the ants. Doing so may lead to a fire ant bite.